(CNN) -- The Tennessee man accused of selling the gun used to kill former NFL quarterback Steve McNair is in custody facing a federal charge of being a convicted felon in possession of a firearm, authorities said Friday. 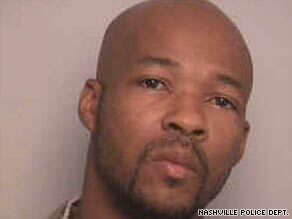 Police say Adrian Gilliam admitted he sold Sahel Kazemi the gun she used to kill NFL quarterback Steve McNair. "This is another example of what can happen with a gun when a felon is selling it on the street with little to no interest other than just selling it for 100 bucks," said Nashville, Tennessee, Police Chief Ronal Serpas. Authorities said federal agents traced the gun used in the Fourth of July murder-suicide to Household Pawn in Nashville, which sold it in January 2002. "Further investigation revealed the 9 mm pistol was later sold for approximately $100 to Adrian Gilliam approximately one to one and a half years ago," Nashville police said in a news release. Gilliam, 33, of LaVergne, Tennessee, told detectives that on July 2 he sold the gun for about the same price to Sahel Kazemi outside a shopping mall. Police said Kazemi, McNair's 20-year-old girlfriend, used the gun two days later to fatally shoot McNair -- a former Tennessee Titans quarterback and married father of four -- and herself in McNair's condominium in downtown Nashville. Gilliam had been convicted of second-degree murder and attempted armed robbery in Florida in 1993, according to the new release, and those felony convictions meant that he could not legally be in possession of a firearm. Along with Serpas, the announcement of the arrest was made by Edward M. Yarbrough, the U.S. attorney for the Middle District of Tennessee; James M. Cavanaugh, the Special Agent in Charge of the Bureau of Alcohol, Tobacco, Firearms & Explosives' Nashville Division; and Mark Gwyn, director of the Tennessee Bureau of Investigation.